LVIV, Ukraine -- When officers of the new patrol police recently arrested a young, unemployed actor named Vladimir for a drunken midday nap on Market Square — the leafy center of this picturesque, cobblestoned city in western Ukraine — two giggling friends asked to snap a selfie with the detainee. 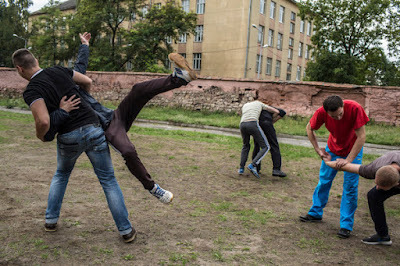 Recruits learned techniques to physically subdue criminals, in Lviv, Ukraine. A fit, fresh-faced police officer consented, allowing them to clamber into the back seat of his white Toyota Prius patrol car while the disheveled Vladimir soon began flirting with the female battalion commander. The scene was a marked contrast with the old police force, an all-male preserve whose officers regularly punched first and then asked questions. “Soft,” pronounced Sgt. Mykola Lozynsky, a veteran at the station where Vladimir, 26, was taken for booking. It is a common appraisal by members of the old police force, known as the militia, of the thousands of novice officers deployed in major Ukrainian cities starting last July. There should be at least 10,000 new officers by the end of the year in a country where a patchwork of law enforcement agencies has about 140,000 uniformed officers. Much is riding on the neophyte force, which is often praised as the only tangible sign of change 20 months after protests toppled the government. Ukrainians pushing for change believe that for any reform to take root, the country needs to rebuild its criminal justice system from scratch, and it particularly must have a less abusive police force. The new patrol officers are envisioned as the independent wedge that will begin to transform the entire system. With the two forces set to begin merging on Saturday, the question is whether the good can drive out the bad, and whether a merged force rife with mistrust between the old and the new can work effectively. “Police reform will be the engine of overall reform,” said Mustafa Nayyem, who is often credited with starting the Ukrainian uprising with a Facebook post. Mr. Nayyem, 34, is one of scores of new, young Parliament members struggling to reshape the petrified system they fought to overthrow. He even plans to head the new police force in two eastern cities once controlled by separatists. To their myriad fans, the new officers embody the right kind of change: idealistic, helpful, diverse, clean and drilled endlessly that public service is their main task. To skeptics, they represent what is fundamentally wrong with the current attempt to overhaul Ukraine: a superficial change to the patina of urban life while venality and incompetence endure behind every government facade. “It is a good image, but it is useless,” said Andriy Dudnyk, a Kiev businessman, describing the new police force. Many Ukrainians criticize what they see as the glacial pace of change and the lack of progress on two issues in particular. No senior figure has been convicted on corruption charges, and investigators have yet to identify anyone responsible for the massacre of about 100 protesters on the Maidan, Kiev’s main square, during the February 2014 uprising. Overshadowing it all is the separatist war in the east, where a cease-fire is finally holding and a peace agreement has been extended past its Dec. 31 deadline. The ultimate status of the breakaway regions, however, and the extent to which Russia will use them to destabilize Ukraine remains a dark cloud. Despite President Petro O. Poroshenko’s promises that he is committed to “deep reform,” Ukrainians increasingly question whether Mr. Poroshenko, a 50-year-old billionaire chocolate baron, is the right man to dismantle an oligarchy. In Ukraine, where the 10 richest men control 20 percent of the wealth, oligarchs buy factories and judges with equal ease. A poll conducted by the Razumkov Center, a policy research organization in Kiev, found that 36 percent of the 2,011 people questioned last summer thought Mr. Poroshenko was the main promoter of change, while 39 percent named him the main brake. Ukraine “is trying to be a new country, but it cannot function with old institutions,” said Mikheil Saakashvili, the former president of Georgia who was appointed the governor of the Ukrainian region of Odessa, at a recent forum. Members of the militia were seen as “monsters,” said Mr. Nayyem, so the idea was to create a popular new force that could leverage its standing to compel change. “Some day, the new police will come into conflict with other branches of the security forces, and the judiciary,” he said. The attempt to make them popular seems to be working. Calls to the police are markedly up in cities where the new officers have been deployed, and some clips from their body cameras — another innovation — that showed officers arresting a drunken soccer star and questioning a bishop, for example, became social media sensations. Not all the attention is positive. One widely shared video showed new police officers beating a vagrant with batons. At least 30 new officers have been dismissed for infractions like sleeping on the job, though none for corruption, Mr. Nayyem said. Their salaries were raised to almost $400 a month, roughly three times the basic police salary previously, to decrease the temptation to demand payoffs. The new police received just 10 weeks of training that included classes on criminal law, reporting traffic accidents and respecting gay rights, another first in Ukraine. Women, previously limited to clerical roles, make up about one-quarter of the new force. American police officers conducted some of the training, funded by the $38 million that the State Department is spending to try to improve the rule of law in Ukraine. The new police deal with low-level infractions, while the militia handles major crimes. The public line is that the two forces get along better all the time, but when they intersect they keep a wary distance. Some militia members, who still run police stations, have brazenly undermined the work of the new police, releasing suspects right under the noses of the officers who arrested them. Four deputy chiefs in Kiev were dismissed over the lack of cooperation, said Eka Zguladze, 37, the first deputy interior minister, who is in charge of overhauling the police. The fact that the government shoved aside the local hierarchy and imported Ms. Zguladze, who once carried out police reforms in her native Georgia, fueled significant resentment, as did the appointment of Khatia Dekanoidze, a former Georgian education minister, to run the national police. “They substitute real action with aggressive rhetoric that all the policemen who worked before were corrupt bribe takers and evil psychologically,” said Aleksey Lazarenko, a police colonel who lost his job under the changes. Among rank-and-file officers, Mr. Lazarenko said, 50 percent think nothing will change, 25 percent think things will improve once the new officers gain experience and 25 percent loathe them. New police officers tend to exude a peach-fuzzy uncertainty when they engage suspects. They also look American because the United States donated the uniforms. Hence the entire program is often labeled “Police Academy” after the slapstick movie series about novice officers running amok. “It is better for somebody to smile at you, remembering an American comedy, rather than to see that old Soviet cop with a 200-pound belly and $200 sticking out of his pocket from his last bribe,” Ms. Zguladze said. Andriy Sadovyi, Lviv’s mayor, extols the new police as a main hope for change. The new patrol police chief here, Yuri Zozulya, was quick to challenge authority, the mayor said, which made him the target of a slur campaign by the old police. Mr. Zozulya, 27, a martial arts aficionado and a former investment banker, provided abundant ammunition. Shortly after he began his new job, he was stopped for speeding, and it emerged that he had six outstanding traffic violations. Old pictures suddenly cropped up on social media, showing candid public moments of him swigging from a bottle of Jack Daniel’s. Finally, he was stopped at the Polish border when he tried to import an undeclared cache of painkillers that he said was for soldiers fighting the separatists. In an interview, he shrugged off the incidents as the teething pains of an unexpected police chief. During the Maidan protests, Mr. Zozulya used his martial arts background to help defend the demonstrators, battling the militia constantly. The Interior Ministry appointed him to the chief’s job partly because he was forceful toward militia members. Since then, Mr. Zozulya has fearlessly issued traffic tickets to a politician and other influential figures. He succinctly summed up the philosophy that the new police officers are supposed to spread throughout Ukraine.